Hot Chocolate just tastes different when made in a clay pot. Traditionally, the chocolate is made according to each family’s recipe and beaten with a wooden molinillo until it is frothy. 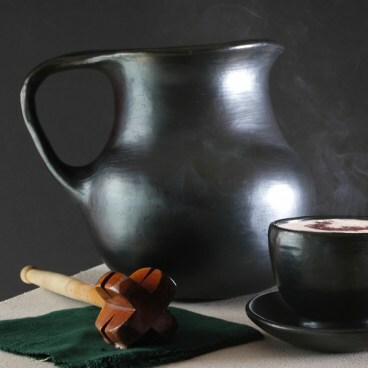 This Clay pitcher is not only good to make the hot chocolate, but looks great to serve any hot or cold beverage. I bought this piece a year ago and it has been used nearly every day. It is beautiful and it cleans up VERY easily. I have used it to boil water, make coffee, tea, hot cocoa and numerous other drinks both hot and cold. It is great for yogurt and ice cream making.It gave my first few batches of food and drinks somewhat of a light smoky flavor, not bad, just noticeable. At this point it no longer gives off any kind of taste. I would love to have another one or two, or three! I have seen them with a lid but they are hard to find and the price is much higher. Based on this piece`s performance I just purchased 2 more La Chamba clay pieces. I am hoping that they are as sturdy, beautiful and useful as this piece has been for me. Beautiful work of art and craftsmanship. I got this to boil water in for hot tea, coffee, hot coacoa etc. It is unique and beautiful piece. I was glad to have gotten it in one piece after having to return several broken clay pieces before. The seller packed the jug really well and put a "fragile" notice on the box - you would think that clay shippers would always do that but they do not! I am very happy with the purchase.